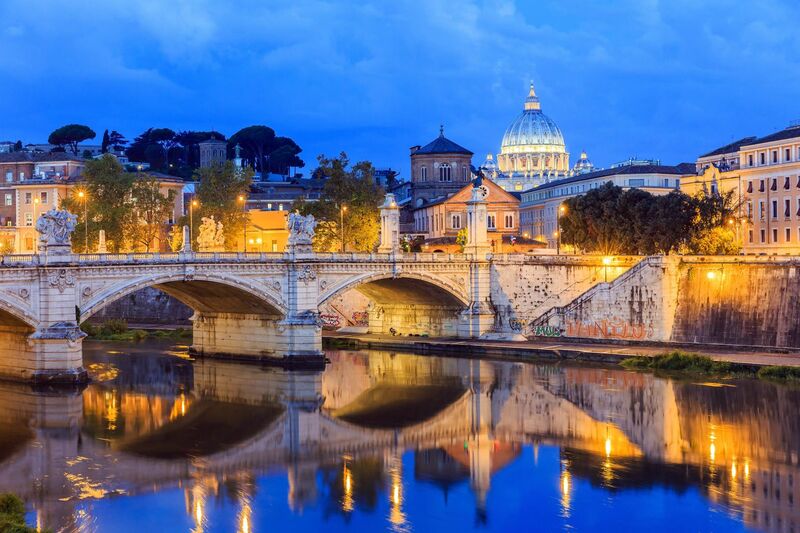 Rome is the undisputed heart of this central Italian region on the Tyrrhenian Sea. But take a stroll into its wider surroundings and you'll discover fascinating historical cities and pristine coastal areas. Beating heart of both western civilisation and Christianity, of legends and history, of ancient roads and resplendent green hills, Lazio is one of central Italy's unmissable regions. Sat on the Tyrrhenian sea, it is home to the gently flowing Tiber whose waters run through mountains and hills until they eventually reach the softer coastline. For beach lovers, the region's coast is studded with pearls from Gaeta, Sperlonga and San Felice Circeo to the south and Sabaudia a little further north. Venture out to sea and you'll hit the wonderful Pontine Islands, with Ponza, Ventotene and Palmarola to explore surrounded by the calm waters of the Mediterranean Sea. Further inland snuggles Lake Bracciano, just a few kilometres northwest of Rome and surrounded by luscious green countryside which offers great opportunities for walking. The highlight of the area is the Castello Orsini-Odescalchi, an imposing castle which sits overlooking the almost perfectly circular lake. Even the shortest of walks through Bracciano town's medieval streets will show just how much this place owes to its Imperial Roman roots but also to the centuries which followed and the many civilisations which have passed through its doors. Not far from Bracciano, you'll find yet another stunning lake. Bolsena is the largest lake of volcanic origin in Europe and holds within it the two picturesque islands of Bisentina and Martana, which are both blessed with fantastic panoramic views of the lake and its tree-lined shores. But Lazio's most obvious, and rather magnificent, trait is its mountainous terrain. Offering optimal skiing opportunities in the winter at resorts in Terminillo, Livata and Campo Staffi, the area also becomes extremely popular for hikers during the summer months. Whatever your preferred mode of transport, Lazio is a region which will leave you wondering how so many centuries have passed since its towns and villages were born and how so many people have come to this place and managed to leave their mark. Most visiting Lazio will be headed to Rome. Formerly the capital of the Roman Empire and today of Italy, for centuries it was the most important hub of social and artistic life, and its fame extended well beyond its borders. In addition to its beautiful landscapes, the region is home to numerous Roman archaeological sites and wonderful museums. Lazio is a region of landscapes with contrast and complete each other with effortless ease. Nature is at the forefront of any visit to the region, even when visiting its large cities. A great example of nature still carving a place for itself behind city walls is the Villa Borghese in Rome. The city's most famous park is a great place to stroll or to take bikes for a more complete tour. The villa itself holds the Galleria Borghese, whose collection houses artworks by Bernini, Titian and many more. It's also a region well known for its spas, whose existence and long history in Lazio is down to numerous hot springs which produce what is believed to be naturally healing water, rich in minerals. They were founded by the Romans, both throughout the Republican and Imperial eras, who constructed sumptuous bathhouses all over the region. A particularly fine example of these is the Terme di Caracalla, located in the centre of Rome. Tivoli is another popular thermal bath, though it is better known for the splendid artwork that covers its buildings rather than for its healing properties. Its distinctive villas, famous throughout Italy, include the Villa D'Este, with intricate fountains, gardens and even a magnificent Renaissance palazzo. The other is the Villa Adriana, former residence of the Roman Emperor Hadrian, which, along with the Villa D'Este, is included on Italy's long list of UNESCO World Heritage Sites. In the immediate vicinity of Rome, the Castelli Romani are an attractive collection of villages and popular with visitors in search of easy day trips from the capital as well as a respite from the heat of the city on warm, summer nights. Ostia, on the other hand, is Lazio's best known seaside resort and is worth visiting for the excavations at Ostia Antica, one of the best preserved examples of a Roman city anywhere in the country. But it's not just the sun-kissed coasts and busy capital of Lazio that hold temptation for the traveller. Rieti, an important ancient city, is full of architecture both from Roman and medieval times, when it became a free city-state and later housed the residence of the Popes. The city of Latina and its surroundings are also worth a visit, with splendid beaches, views out over the Tyrrhenian Sea, charming villages and the unspoilt nature of the Circeo National Park. The area of Tuscia, with its green countryside and enchanting medieval villages, is fantastic place to discover if you're after great food and a relaxing environment. Its Via Francigena, which runs all the way from England, through France, Switzerland and into Italy, is increasingly popular with pilgrims from all over the world and walkers in search of glorious views. Despite being one of the most beautiful provinces in Lazio, Ciociaria and its capital are still little known amongst visitors. They offer incredible scenery and small villages surrounded by greenery and numerous historical sites. From the mosaic of cultures that distinguishes Lazio from anywhere else in Italy, you'll find beguiling traditions and customs, as well as distinct dialects that seem to have very little to do with the Italian language. The region also boasts one of the most densely populated festival calendars in the country, though one of the most colourful times is undeniably carnival time which falls on the week running up to Shrove Tuesday and Ash Wednesday. Some of the best celebrations take place in Ronciglione and Poggio Mirteto. Held in Gradoli on Ash Wednesday, the 'Pranzo del Purgatorio' (Lunch in Purgatory) is a mix of archaic rituals and Catholicism, as are many more of the region's festivals. The best time to see them is through the spring and summer months, as well as the wine festivals which are popular throughout the Castelli Romani region. Amongst some of the best are those organised in Bolsena, Poggio Moiano, Genzano (one of the villages in Castelli Romani) and in Acquapendente, where the Festa dei Pugnaloni celebrates the village's liberation from German emperor Frederic I Barbarossa in the 12th century with flowers and an artwork competition. Bucatini all'amatriciana. This is Lazio's culinary speciality. According to the original recipe, bacon should be added to the sauce. Diced and mixed with chilli peppers, it really adds a bit of bite to the tomato sauce. Prepare the pasta, add the sauce, and grate some 'pecorino', Roman sheep milk cheese, on top of it. Gnocchi alla romana. This particular gnocchi dish is prepared with pasta made from semolina, milk, butter, and salt. The paste is shaped into small circles and placed in an oven dish before covering with melted butter and parmesan cheese. Bake in the oven until they're nicely browned. Abbacchio alla cacciatora. This is another particularly Roman dish, a stew made with lamb. The thighs and shoulders are used, with a cacciatora recipe demanding the addition of garlic, rosemary, white wine, anchovies and chilli. Coda alla vaccinara. This is a dish born in the restaurants that surrounded the slaughterhouses, where workers would collect pieces of meat that couldn't be sold and brought them for cooking. After having taken the fat from the meat, it would be stewed in a rich smelling sauce of carrot, onion, celery, raisins, pine nuts and bitter chocolate. A real treat! Saltimbocca alla romana. This is a quick and easy dish that you can't miss on a trip to Lazio. Slices of veal breast are served with a slice of ham and a sage leaf, cooked in a little butter and a dash of white wine. Delicious! Il pangiallo. These golden cakes actually come from ancient Rome. It was custom to distribute them during the feast of the winter solstice, in order to encourage the return of the sun. Traditionally pangiallo is made with a mixture of dried fruit , honey and candied citron , which is baked and covered by a layer of egg batter . Nowadays, you'll find some made with plums and apricots and others with almonds and hazelnuts. Find weekly weather forecasts for Lazio . Different criteria make it possible to predict with precision the best time of year to go to Lazio . A comprehensive weather score, made up of temperature indicators, bad weather predictions, sunshine levels and wind speeds, will allow you to choose the activities best suited to the weather conditions and therefore make the most of your holiday in Lazio . Our journalists' reviews for you 40 hotels Italy . Take a look at our hotels, their facilities or their value-for-money score according to your departure dates so that we can find the best offer to suit you Italy . Book a hotel Italy it's never been so simple !